BizEquity announces strategic partnership with eMoney Advisor. Vietnam Public Joint Stock Commercial Bank (PVcomBank) deploys digital banking platform from Misys. Let’s Talk Payments interviews Konstantin Rabin, Kontomatik CMO. BAI Retail Delivery conference attendees select MX as the Innovation Showcase Award winner. Global AutoTrading integrates with Tradier to extend brokerage services. Avalara announces sales-tax accuracy guarantee. LOYAL3 Securities will act as co-manager for Square’s IPO. Customers of the Microsoft Dynamics NAV rollout will automatically have free access to Tradeshift’s e-invoicing solution. Arxan now secures applications running on 500+ million devices. HedgeCoVest launches its real-time, hedge fund replication platform. First Republic Bank to deploy virtual banking solutions from Q2 Holdings. The IT Nerd reviews FinanceIt. The Independent takes a look at Klarna and the power of micropayment. oneID featured in MacWorld as a two-factor authentication app for the Apple Watch. Allied Wallet now a supported online payment provider of Spreedly. emX Select from eMoney Advisor now integrated with Dropbox. Süddeutsche Zeitung features Trustly and Klarna (in German). Bank Innovation profile on alternative fintech capitals looks at Iceland and highlights Meniga. Ripple Labs adds former Depository Trust & Clearing Corporation (DTCC) CEO Donald Donahue as advisor. A review of local fintech startups in the Boston Globe features Kensho and Quantopian. Temenos wins “Best Core Banking System” honors from Banker Africa East Africa Awards 2015. American Banker considers how Namu covers the emotional side of banking. Entrepreneur lists Patch of Land as 1 of 100 brilliant companies to watch in 2015. Pendo Systems wins awards from international financial technology publications, the New Jersey Technology Council, and SWIFT. Finaeos teams up with TATA Consulting Services to help SMBs take advantage of Regulation A+ of the JOBS Act. eMoney Advisor, MicroStrategy, Yseop. What do these three companies have in common? In addition to being Finovate alums, all three were recognized by MyPrivateBanking Research as “leading vendors” in the field of digital solution providers for wealth managers and financial advisers. We see that traditional wealth managers cannot defend their business model against robo-advisers and other digital do-it-yourself tools by merely pointing out that their advisers offer a ‘human touch’ and specific banking know-how. They need to reinvent their business model from the ground up in order to arrive in the 21st century. eMoney Advisor was highlighted in the report in the mobile app category. 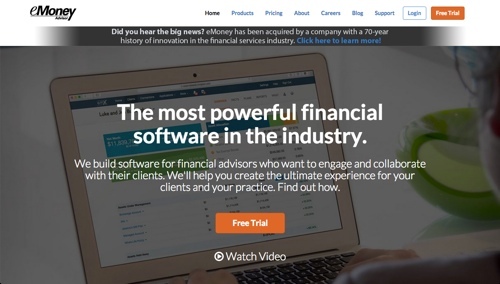 eMoney Advisor made its Finovate debut at FinovateFall 2014, introducing a “reboot” of its wealth-planning system for financial advisers, EMX. The company was founded in 2000, and is headquartered in Conshohocken, Pennsylvania. Last month, eMoney Advisor announced that it had been acquired by Fidelity Investments for $250 million. Read our Finovate Debut post for eMoney Advisor. Founded in 1989 and based in Tyson’s Corner, Virginia, MicroStrategy specializes in enterprise software. The company’s solutions range from its Business Intelligence (BI) platform to its Mobile Platform and Applications to Usher, the mobile identity network MicroStrategy unveiled at its Finovate appearance in San Francisco in the spring of 2013. Like eMoney Advisor, MicroStrategy was also recognized by MyPrivateBanking Research for its mobile app development platform. Yseop may seem an unlikely member of this trio; however, the company distinguished itself as a resource for financial managers in the “analytics, natural language generation and other solutions” category. An innovator in the field of putting artificial intelligence to use to support business operations, Yseop has developed technologies like Yseop Sales Force Productivity Suite (demoed at FinovateSpring 2014) and Yseop Financial Suite (demoed at FinovateFall 2013). The company was founded in 2008, and is headquartered in both Dallas, Texas, and Lyon, France. John Rauscher is CEO. Also noted in the report were Finovate alums Crealogix (mobile apps), Temenos (mobile apps), and Narrative Science (analytics, natural language generation, and other solutions). ProfitStars adds Banno Mobile solutions to the Independent Community Bankers of America (ICBA) Preferred Service Provider program. Lending Club to serve as exclusive POS financing for Alibaba.com’s U.S. business buyers. Visa CEO selects NBCUniversal’s Vasant M. Prabhu as CFO. The Philippine National Bank deploys core banking solution and EFT switching solution from FIS. ABC2 News in Baltimore talks with Robb Gaynor of Malauzai Software about mobile banking apps. Thinking Bigger profiles Blooom and its new way to 401(k). The Costa Rica Star features Azimo, a money-transfer service. Financial Advisor’s look at assets managed by roboadvisors highlights Wealthfront, Financial Guard, Personal Capital, and Betterment. Jumio enhances capturing technology for its ID card-scanning service, Netverify. Discussion of the “positive powers” of fintech in The Guardian features ACI Worldwide, Azimo, TransferWise, Ripple, and Blockchain. Check out our final Sneak Peek before we launch into a record-breaking FinovateEurope. Micronotes receives $910k in funding. CSO Online features Nymi, Myris, and EyeVerify. Kabbage funding More Than $3 Million per Day. Remitly announces expansion into India. Congratulations to our latest “one and done alum,” eMoney Advisor. The wealth management technology company that made its Finovate debut last September has been acquired by Fidelity Investments. The terms of the acquisition were not disclosed; however, Philly.com is reporting that Fidelity paid more than $250 million for the company. 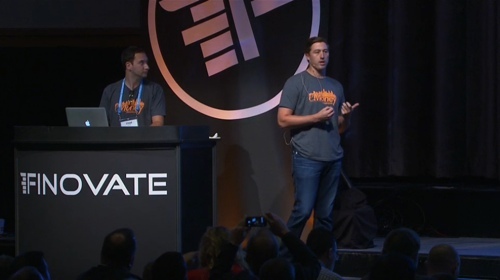 Above (left to right): Chad Porche, User Interface Designer, and Kyle Wharton, Business Development, at FinovateFall 2014.
eMoney Advisor will be used to help Fidelity build out its data management, office, and collaborative tools for investors and advisors. Fidelity’s Institutional clients who work with registered investment advisors, broker-dealers, and banks will be the first to take advantage of the technology. 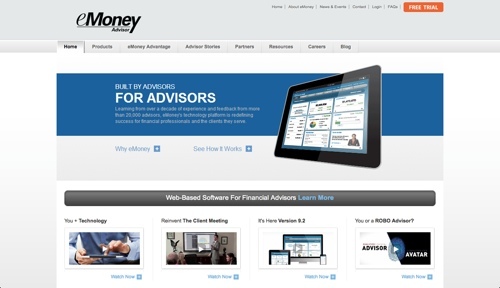 Founded in 2000 and headquartered in Conshohocken, Pennsylvania, eMoney Advisor’s platform helps financial professionals serve the investment and wealth management needs of their clients. eMoney has 25,000 registered investment reps and 46 out of the top 50 broker dealers using its technology, which tracks more than $1 trillion in client assets. EMX, the company’s “rebranded” platform, was previewed at FinovateFall 2014 and released in December. 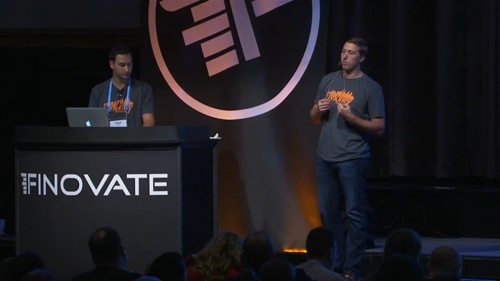 If you missed it last fall, check out our Finovate Debuts feature on e-Money Advisor. The Finovate Debuts series introduces new Finovate alums. At FinovateFall 2014, eMoney Advisor demoed its EMX platform, an upgraded version of their wealth-planning system for financial advisors. The more you learn about eMoney Advisor, the more you realize how much automation is making investment advice easier to produce by advisors and more accessible to clients. You also realize that there is still a role for human advisors, especially when equipped with a new generation of technical tools that can help them do their jobs better. eMoney Advisor was founded by Edmond Walters, a veteran financial advisor. His initial idea was to build a personal financial management tool that could be used with clients. But as the project developed, and he began to take feedback, it became clear that the project had a much larger, broader destiny than PFM. “PFM was probably too early,” Wharton explained. “There was a niche need among clients. But the need was not very strong.” Instead, issues like insurance and wealth planning loomed larger as concerns for a broader base of clients. To this end, eMoney’s demo at FinovateFall was, as Wharton calls it, “both a rebirth and rebranding” of the platform. The new platform, EMX (“the eMoney Experience”), introduced in New York last fall is due out in mid-December. In building the new platform, the company focused on leveraging third-party integrations and ensuring ease of use. The goal is to help financial advisors serve their clients and build better relationships based on collaboration and transparency. To this end much of the functionality in EMX is geared toward promoting interactivity. This includes screen sharing features, an easy-to-read interface, and a client portal that an advisor’s clients can access at any time to view or print a report on their finances. Below shows the main interface, providing at a glance information on assets under management, client non-held accounts, top holdings by net value change for the day, and more. The page also features a Financial Feed – “a Facebook or Twitter feed for your book of business” – that provides advisors with everything from alerts, alarms, tasks, and news. eMoney Advisor is working to include data feeds from sources like MorningStar, which will help advisors, for example, see and understand how an upcoming earnings release from Microsoft may impact his or her client’s holdings. The platform has a number of portals that allow financial advisors to quickly see a client’s net worth, investments, asset allocation and more. The platform lets advisors run reports including ad hoc performance reports, and includes 200 predesigned reports that are updated nightly. A Facts Portal allows for speedy onboarding, whether the advisor is working solo or with a client present. The platform has both a presentation mode and screen sharing functionality to make it easy for advisors and their clients to collaborate. 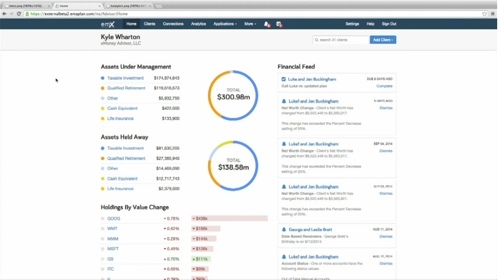 The Plans Portal, according to Wharton, is where the advisor can “show off.” This analytics section gives the advisor the ability to run simulations, adding and exchanging different financial scenarios to see what net effect different financial assumptions have on the overall financial picture. The platform also has an online storage vault for keeping financial plans and records. Another way of appreciating the collaborative, transparency-focus on the new platform from eMoney Advisor is via the Client Portal. This shows account information, net worth, investments, insurance, budgets, spending … everything from wealth management to the most basic personal finance management features are here. In addition to providing a lot of transparency for clients, advisors can also take advantage of the portal to conduct tasks like aggregating held-away accounts. Analytics are the other key feature in EMX. Typically, advisors have to work with more than one program in order to compile the analytic data on their clients. EMX gives the data back to the advisor in a way that is easy to read, understand, and act on. Seeing assets by account type, or clients by age group, or ratios between managed and held away accounts can give advisors insights into their advisory business that might otherwise be difficult to see. And all of this contributes toward the goal of helping advisors leverage technology to help people more efficiently. “It’s really mixing the art and the science,” said Kyle Wharton from the Finovate stage last fall. “It’s the value of the financial advisor, the expertise of that financial advisor, the knowledge of that financial advisor mixed in with our technology. So far so good. The company partnered with HiddenLevers, a portfolio stress testing platform, in November. And also that month announced that it has surpassed $1.4 trillion in investable assets managed by the 25,000 financial professionals using the platform. All of this is strong momentum leading up to the official launch of eMoney Advisor’s EMX platform in December. 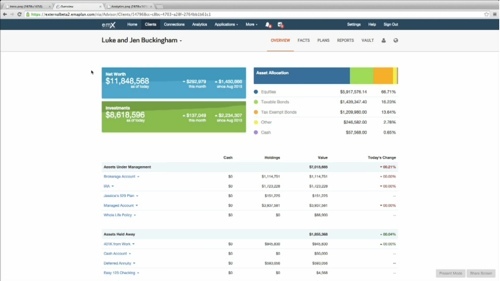 Watch eMoney Advisor demonstrate EMX at FinovateFall 2014. Our next presenter is eMoney Advisor, demoing EMX. Metrics: eMoney aggregates more than $1T in client assets over 878,243 accounts, managed by a network of more than 20,000 financial services professionals across the country.